Listening to this music one must remember that the events being celebrated are by definition happening for the first time ever, so a sense of awe with the occasional shock goes with the territory! The concert began with the orchestra portraying the initial chaos, followed by the archangel Raphael announcing the void and the chorus whispering the mystery of the Spirit moving on the dark waters, culminating in the shock of light, with Ashtead Choral at full throttle. Andrew Storey conducted with verve and aplomb, marshalling his huge forces with great dexterity. Lucinda Cox, soprano, (Gabriel and Eve) sang with such beauty of tone and range, fully exploiting the generous acoustic of the church and always demanding the attention of the rapt audience. Lizzy Humphries, alto, made a brief but beautiful contribution. Mark Chaundy, tenor, sang the role of Raphael with supreme clarity in diction and vocal range and colour. James Oldfield, bass, sang with both strength and warmth as Uriel and Adam. It was such a great pleasure to be able to hear every word so clearly enunciated by them all. The playing of Kent Sinfonia was a sheer delight as they filled the church with a full-on, well-blended sound with many opportunities for the individual instrumentalists to shine in Haydn’s masterpiece. Whether playing in their own right or underpinning the soloists and choir they were consistently superb. Ashtead Choral Society clearly relished the challenges of this piece and were well drilled in its demands, not least the sections which demanded high energy and stamina, particularly in the closing numbers of each half, which expressed passionate praise for the Creator, both being thrilling highlights. They dealt well with the intricate interweaving of text and notes at each turn in all sections. For me, one of the memorable highlights was Lucinda Cox singing of the creation of various birds with the wind section of Kent Sinfonia having immense fun interpreting their sounds. The whole event was a joy from beginning to end and a fitting reward in itself for all the hard work put in by all concerned. This was Ashtead Choral Society’s first concert under their new Musical Director, Andrew Storey, who is firstly to be congratulated on putting together a programme of immense variety and with so many highlights, including four outstanding soloists. The evening commenced with a tour de force performance by Martyn Noble of Bach’s Fantasia for Organ in G, BWV 572, taking full advantage of the church’s wonderful acoustics with a virtuosic panoply of brilliance. Eight minutes of sheer bliss! 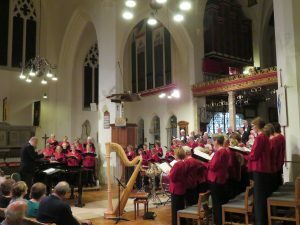 The choir followed with Leonard Bernstein’s Chichester Psalms (1965), sung wholly in Hebrew, accompanied on the organ, and harp (Oliver Wass) and percussion (Matthew Turner). The first movement including Psalm 108, verse 2, and the whole of Psalm 100, was delivered with great energy and commitment by choir and instrumentalists alike. ‘A joyful noise unto the Lord’ indeed! The second movement started with a gorgeous setting of The Lord is my Shepherd with counter-tenor Roderick Morris intoning this most famous of psalms with enchanting sensitivity, underpinned later by the ladies of the choir, but this is suddenly brought to a halt by the gentlemen singing ‘Why do the nations rage?’ from the second psalm, a display of Hebrew speed singing with albeit restrained ferocity before the reprise of Morris’s fine solo. The third movement is a far more calm and peaceful affair of affecting beauty with the text of Psalm 131 and culminating in the first verse of Psalm 133, ‘Behold how good, and how pleasant it is, for brethren to dwell together in unity’. Everyone involved can be justly proud of this fine performance of a very difficult piece, as was demonstrated in the rapturous applause which followed. Then Morris and Wass treated us to excellent renditions of Britten’s arrangements of The Ash Grove and The Salley Gardens which pleased the audience enormously. Noble accompanied the choir at the piano for Karl Jenkins’ A Celebration of Christmas, a suite of six songs including two original pieces written by Jenkins’ wife, Lullay and Sleep, Child of Winter. It included a version of In Dulci Jubilo with pulsating rhythms reminiscent of Bernstein’s America, a Silent Night with warm harmonies, a rousing Go, Tell it on the Mountain. The most memorable was the closing Son of Maria to the tune of a well known Catalan folk tune. Storey brought out the best of the choir in these emotionally charged pieces. The concert was held in support of the charity Combat Stress. A representative detailed the work done since 1919 to help veterans deal with mental health issues, a very poignant reminder of those whose lives can be devastated in an instant. After the interval Oliver Wass performed Prokofiev’s Prelude in C and Manuel de Falla’s Spanish Dance no. 1 on the harp. No one would suspect that Prokofiev had written such mellifluous melodies! Everyone was delighted with such an exceptional display of skill and depth of mesmerising musicianship. Britten’s A Ceremony of Carols, with harp accompaniment, closed the concert in fine style with the choral society pulling out all the stops in every section, but special praise must go to the sopranos for their leading contributions. The framing procession and recession were based on Gregorian chant and like the rest of the piece, beautifully sung. Highlights were the jollity of Wolcom Yole! And As Dew in Aprille, the forceful This Little Babe and Deo Gracias. Soloist Roderick Morris returned for a soulful That Yongë Childe with Oliver Wass sensitively underpinning him, while later playing the harp interlude to great effect. All in all a splendid evening of superb entertainment, thought provoking words, and a well arranged start to Advent! Well done to all concerned, above all Andrew Storey. We're looking forward to singing this great music. And delighted to be supporting Rianna's Fund. It'll be a fantastic evening. Come along!